Safety, Durability, Flexibility and Utility Within Reach: Hose stations are widespread in industrial applications. Having safe, accurate, functional and durable hose stations is an important element in the foundation of many industrial processes. Armstrong International builds water mixing and steam/water mixing hose stations using superior process control valves, high-grade materials and components, and years of experience providing top-notch equipment for demanding applications. A wide range of accessories like hose, reels and nozzles allows you to order a package perfectly suited to meet your requirements. Steam & Water Mixing Hose Stations. . . These hose stations are centered on the intrinsically safe Steamix mixing valve, which will not pass live steam in the event of either a significant pressure reduction or complete failure of the cold-water supply. A wide range of possible operating conditions makes these systems flexible enough to handle any washdown job. Additionally, the simple, rugged construction keeps the Steamix valve operating in adverse conditions that cause other valves to fail. 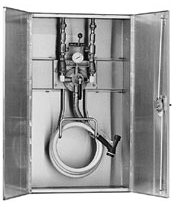 Standard Steam & Water Hose Stations. . . The Steamix® Steam and Water Hose Stations – Standard series is supplied fully assembled and pressure tested in the following configurations. STEAMIX Hose Stations are designed to improve efficiency and reduce risk when mixing STEAM and WATER for washdown. Steamix® Model 2030 is a steam/water mixing valve of brass/stainless steel construction. Steamix mixing valve, featured on all Steamix steam and water hose stations by Armstrong, will not pass live steam in the event of either a significant pressure reduction or complete failure of the cold-water supply. In the event of either a complete failure of the inlet cold-water supply or a reduction in cold-water pressure to below 20 (± 5) psi (1.4 bar), STEAMIX will respond with a complete shutdown of outlet flow. If there is a structural failure of the primary operating component (diaphragm), STEAMIX will "fail safe" to cold water. 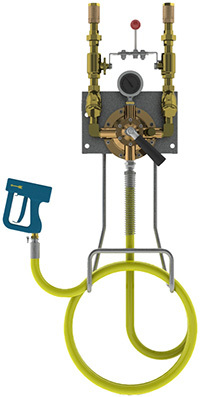 To prevent over-temperature selection by the user and the potential for overheated water and flash steam presentation common with other types of hose stations, STEAMIX is supplied with a single-temperature locking set. STEAMIX Model 2031 valve is supplied as standard with 3/4" inlet union connections, an outlet ball valve for flow control and an outlet dial thermometer. The unit is supplied fully assembled, pressure-tested. The valve is supplied as standard with 3/4" inlet union connections, an outlet ball valve for flow control and an outlet dial thermometer. The unit is supplied fully assembled, pressure-tested and installed on a stainless steel hose rack. STEAMIX® Model 2033 is a steam/water mixing valve of brass/stainless steel construction. 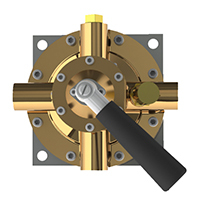 The valve is supplied as standard with 3/4" inlet union connections, an outlet ball valve for flow control and an outlet dial thermometer. The unit is supplied fully assembled, pressure-tested and installed on a stainless steel hose rack. STEAMIX Model 2033 includes 25 feet of "safety yellow" washdown hose, rubber cushioned spray nozzle with swivel adapter, and a stainless steel nozzle hook. STEAMIX® Model 2033-FMCD is a steam/water mixing valve of brass/stainless steel construction. 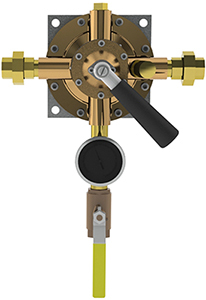 The valve is supplied as standard with 3/4" inlet union connections with integral strainers, an outlet ball valve for flow control and an outlet dial thermometer. The unit is supplied fully assembled, pressure-tested and installed on a stainless steel hose rack. 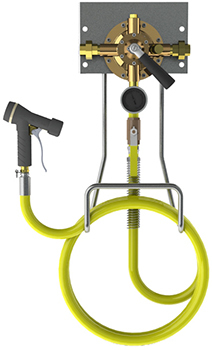 STEAMIX Model 2033-FMCD includes 25 feet of "safety yellow" washdown hose rated for 400 psi (28 bar) and 400°F (88°C), rubber cushioned spray nozzle with, swivel adapter, a stainless steel nozzle hook and inlet check valves. STEAMIX Model 2033-FMCD is mounted within Type-304 stainless steel, two-door cabinet with a 2" (50 mm) flange, and it is designed for recessed installation. Premium Steam & Water Hose Stations. . . The Steamix Steam and Water Hose Stations – Premium series is supplied fully assembled and pressure tested in the following configurations. Steamix® Model 2031P is a steam/water mixing valve of brass/stainless steel construction. The valve is supplied as standard with integral inlet supply risers comprising 3/4" Y-type strainers and 3/4" ball valves cross-linked by a stainless steel bridge piece and lever for simultaneous on/off control of both inlet supplies. The unit is supplied fully assembled and pressure-tested. Stainless Steel dual scale top mount Thermometer and Inlet Check Valves Included. STEAMIX® Steam and Water Hose Stations and Mixing Units will not pass live steam. The valve is supplied as standard with integral inlet supply risers comprising 3/4" Y-type strainers and 3/4" ball valves cross-linked by a stainless steel bridge piece and lever for simultaneous on/off control of both inlet supplies. The unit is supplied fully assembled, pressure-tested and installed on a stainless steel hose rack. Stainless Steel dual scale top mount Thermometer and Inlet Check Valves included. STEAMIX® Model 2033P valve is supplied as standard with integral inlet supply risers comprising 3/4" Y-type strainers and 3/4" ball valves cross-linked by a stainless steel bridge piece and lever for simultaneous on/off control of both inlet supplies. The unit is supplied fully assembled, pressure-tested and installed on a stainless steel hose rack. Stainless Steel dual scale top mount Thermometer and Inlet Check Valves included. STEAMIX Model 2033P includes 25 feet of "safety yellow" washdown hose rated, low-heat-transfer polymer spray nozzle with trigger guard, swivel adapter, and stainless steel nozzle hook. 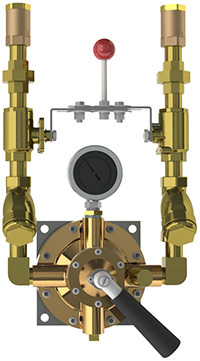 STEAMIX® Model 2033P-FMCD is a steam/water mixing valve of brass/stainless steel construction. 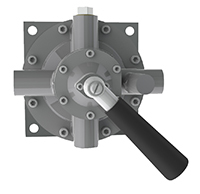 The valve is supplied as standard with 3/4" inlet union connections with integral strainers, an outlet ball valve for flow control and an outlet dial thermometer. The unit is supplied fully assembled, pressure-tested and installed on a stainless steel hose rack. Stainless Steel Steam & Water Hose Stations. . . The Steamix Steam and Water Hose Stations – Stainless Steel series is supplied fully assembled and pressure tested in the following configurations. 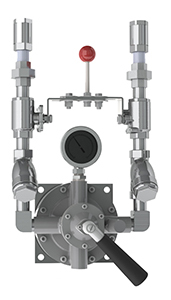 STEAMIX® Model 2030SS is a steam/water mixing valve of Type 304 stainless steel construction. The valve is supplied as standard with all stainless steel (SS) integral inlet supply risers comprising 3/4" Y-type strainers and 3/4" ball valves cross-linked by a stainless steel bridge piece and lever for simultaneous on/off control of both inlet supplies. The unit is supplied fully assembled and pressure tested. The valve is supplied as standard with all stainless steel (SS) integral inlet supply risers comprising 3/4" Y-type strainers and 3/4" ball valves cross-linked by a stainless steel bridge piece and lever for simultaneous on/off control of both inlet supplies. The unit is supplied fully assembled and pressure-tested and installed on a stainless steel hose rack. Stainless Steel dual scale top mount Thermometer and Stainless Steel Inlet Check Valves included. STEAMIX® Model 2033SS is a steam/water mixing valve of Type 304 stainless steel construction. The valve is supplied as standard with all stainless steel (SS) integral inlet supply risers comprising 3/4" Y-type strainers and 3/4" ball valves cross-linked by a stainless steel bridge piece and lever for simultaneous on/off control of both inlet supplies. 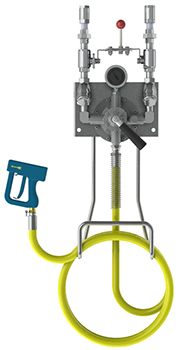 STEAMIX 2033SS includes 25 feet of "safety yellow" washdown hose rated, SS rubber cushioned spray nozzle with SS swivel adapter, a stainless steel nozzle hook and SS inlet check valves. STEAMIX® Model 2033SS-FMCD is a steam/water mixing valve of Type 304 stainless steel construction. The valve is supplied as standard with all stainless steel (SS) integral inlet supply risers comprising 3/4" Y-type strainers and 3/4" ball valves cross-linked by a stainless steel bridge piece and lever for simultaneous on/off control of both inlet supplies. The unit is supplied fully assembled, pressure-tested and installed on a stainless steel hose rack. STEAMIX Model 2033SS-FMCD includes a Stainless Steel dual-scale top mount Thermometer, 25 feet of "safety yellow" washdown hose rated, SS rubber cushioned spray nozzle with SS swivel adapter, a stainless steel nozzle hook and SS inlet check valves. STEAMIX Model 2033SS-FMCD includes Type-304 stainless steel, two-door cabinet with a 2" (50 mm) flange, and it is designed for recessed installation.